Roksan Radius 5.2 review | What Hi-Fi? 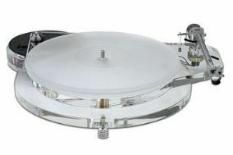 There wasn't much wrong with the original version of this turntable, the Radius 5. It was beautifully made, sensibly priced and a joy to listen to. We liked it enough to give it an Award back in 2007. So, as is Roksan's way, they've gone and changed it. The revisions are mostly subtle. The power supply has been upgraded to deliver a cleaner signal to the motor, making it run smoother. The motor has a flexible mounting, and the compliance of this has changed, as has the drive belt. The idea behind all these tweaks is to improve speed stability. Other changes amount to a slightly upgraded Nima unipivot tone arm, tweaked suspension and up-rated feet. Such minor modifications all make this latest Radius unchanged in character, but better in most ways. The Radius has always been an articulate performer and this new version is no different. With a Goldring 2400 moving magnet cartridge (£180) in tow, it sounds agile and tuneful, digging up a mass of fine detail that much of its competition would ignore. This detail is organised in a cohesive and highly musical manner that draws the listener into the music. Low frequencies are taut and punchy, and there's a wonderful stability to the player's stereo imaging. The soundstage is nicely layered, focused and impressively stable. You can add excellent timing and strong dynamics to the list of plus point, too. Complaints? Just one. We'd like a lid to keep the dust off. We've always been great fans of the Radius, and the 5.2 version simply confirms our view. Don't buy anything else at this price level without trying this one first.